Quality assisted hearing experience is now made possible with the RCA Symphonix Digital Hearing Amplifier. Listen with a healthy amount of sound to satisfy needs and demands of everyday life and its adventures. The RCA Symphonix Digital Hearing Amplifier offers a speech frequency amplification. With the help of this, one can hear the voice clearly and respond more effectively to conversations. Such a feature was made possible with the help of digital hearing amplifiers. These amplifiers can determine speech and background noise. In addition to that, this hearing aid also features an active layered noise reduction. This serves as a filter to provide crisp and clear sound quality. The RCA Symphonix Digital Hearing Amplifier possesses three volume settings for different environments with different hearing and sound conditions. First among these is for the office setting, where minimal noise is expected. Another one among these three is the setting for large crowded events, wherein more and louder noise is expected. Last among these is the setting ideal for watching TV. All these three are conveniently accessible and adjustable through a button in the device. One can also interchange along with these settings by adjusting the volume. Regarding its structure, this hearing enhancement device comes with a thin profile. This means that it won’t inhibit with eyeglasses or sunglasses. As for its size and weight, users can enjoy the minimalist style and lightweight characteristic of this device. Upon purchasing, the RCA Symphonix Digital Hearing Amplifier package will include many items. The package contains two pieces of digital hearing amplifier earpiece and medium ear tubes for the left and right ear. Additional items also include a wide ear tube and a case for carrying it. Lastly, the package provides seven pieces of standard 312 batteries, which will sustain the device for a whole week. Multiple setting for different environments and conditions offer excellent options for the hearing impaired. Its systematized sound filtering and identification enhances the character of the sound delivered and heard. The tiny size, light weight and this profile of the device give an “invisible” feel to the user. Batteries are already included in the package upon purchase. Its size might offer a disadvantage to those who have poor eyesight and big fingers or hands. Compared with other hearing aids in the market, it has fewer programs to choose from. Tends to deliver irritating feedback to the user when drawn near an object. 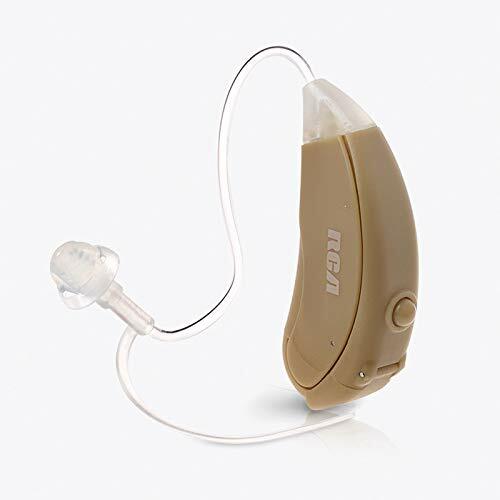 The multi-functionality of this hearing enhancement device and the convenience upon using this gives it an excellent worth. With its systematized feature of filtering and delivering good quality sounds, one can be assured of the crisp and clear sound to be delivered. What also good about this feature is that the process of changing from one feature to another is stress-free. However, this function could be a bit of a nuisance to those who have eye problems or large fingers. Also, hearing enhancement and ear protection are the noes demanded, then RCA Symphonix Digital Hearing Amplifier gives an excellent worth. All the unnecessary and unwanted sounds are eliminated or reduced to deliver just the superb quality of sounds. Its physical features also add up to the value of the device. It can be worn anytime, anywhere, on any occasion without worrying whether it will ruin their get up or not. Also, it is not bulky and gives convenience. Even if eyewear is a part of the user’s worn materials, this equipment would not be a bother. Also, it fits snuggly into one’s ear. Worries about it getting dislocated or removed won’t surface just that easily. Considering the size of this device and package inclusions, your money can already go a long way and give life device a good long life. From the material needed to supply power to the maintaining the optimal state of the device, the package has got you covered. Topping the list of those will find this beneficial is, of course, people with hearing impairments. They can live a completely normal life and hear crystal clear. They can adapt to the different environments and the acoustic conditions of each. Aside from that, it also keeps their ears away from further damage through its protection features. Aside from this group of people, the RCA Symphonix Digital Hearing Amplifier is also beneficial for wildlife enthusiasts. Wildlife enthusiasts include those who are into hunting, scouting, wildlife monitoring, and the like. With sounds playing a vital role in the efficiency and effectiveness of the people involved, a hearing assistance device would be handy. It can help them in detecting animals lurking or hiding nearby or from afar. This will play a good role in keeping them safe from wild animals as well. Also, with the protection features of the equipment, they are also protected from shocking sounds. These sudden, shocking and deafening sounds refer to those emitted by guns used for hunting. When these sounds enter an unprotected ear, it could lead to damage. Also, this will be a good find for bar-goers or DJs. Taking into consideration the amount of noise they have to handle, dangers for the hearing organs are also nearby. They can benefit from the RCA Symphonix Digital Hearing Amplifier’s sound reduction feature. Though it might be quite rare, DJs can also make use of the sound enhancement as a tool for producing better party music. With its functions, features, and benefits, the RCA Symphonix Digital Hearing Amplifier is one of the best in the market. It has everything that one could ask for in a hearing aid and a lot more. The package itself already helps in maintaining its excellent performance by providing the necessary things. In fact, this product could serve its users for a more extended period, given the proper care and usage. Though disadvantages are at bay, these are entirely negotiable, and some alternatives can be done. With all its characteristics and customer reviews online, the RCA Symphonix Digital Hearing Amplifier is not a product that’s easy to ignore.